Promoting the use of humane, effective scientific protocols that are marketed transparently by ethical pet professionals to positively impact the lives of pets. It is with great pleasure that I am now able to inform you that, on September 25, 2017, PPG will be rolling out its Shock-Free Coalition. This is an initiative that has been developed through the PPG Advocacy Committee over the last 12 months. Its aim is to build an international movement committed to eliminating shock devices once and for all. The Shock-Free Coalition will feature a Shock-Free Pledge, a signature drive, and the rollout of tools and resources to help you help us promote the initiative across our communities. We are also developing “Blueprint” documents to support the execution of local and targeted legislative initiatives. These will be readily available from the Shock-Free webpages. During the week of September 25, we will be featuring several live events in celebration of this initiative and will be joined by Dr. Karen Overall, Jean Donaldson, Dr. Marc Bekoff, PPG Project Trade Ambassadors and many more. We invite you to attend all these events, fly the new Shock-Free Coalition logo, and circulate our promotional social media tools using the hashtag #ShockFreeCoalition. If you have your own blog, we also encourage you to blog the press release we will be sending you announcing the rollout of the #ShockFreeCoalition and, we hope, your participation in the initiative. The press release can, of course, also be circulated far and wide on social media, again with the accompanying hashtag. To enable you to understand the extent of this great initiative I am sharing with you below our Shock-Free Coalition Pledge. During the week of September 25, please show your support for the initiative by adding your name to the pledge as we all work together toward ending the practice of using electric shock to train and care for pets. I will email you again in a few days with a copy of the complete rollout schedule so you can enjoy the events, sign the pledge, check out the new Shock-Free Coalition site pages, help us promote this initiative and drive pledge signatures. The key purpose of the Shock-Free Coalition is to build a strong and broad movement committed to eliminating shock devices from the supply and demand chain. This goal will be reached when shock tools and equipment are universally unavailable and not permitted for the training, management and care of pets. The Shock-Free Coalition believes that pets have an intrinsic right to be treated humanely, to have each of their individual needs met, and to live in a safe, enriched environment free from force, pain and fear. 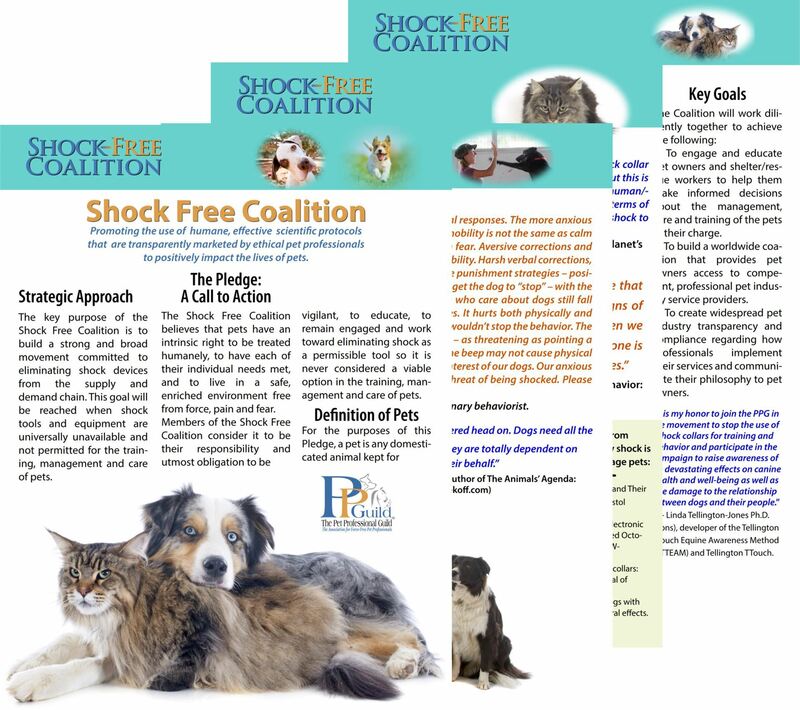 Members of the Shock-Free Coalition consider it to be their responsibility and utmost obligation to be vigilant, to educate, to remain engaged and work toward eliminating shock as a permissible tool so it is never considered a viable option in the training, management and care of pets. For the purposes of this Pledge, a pet is any domesticated animal kept for companionship, work or pleasure. This applies to pets already in homes, as well pets in shelters and rescue organizations waiting to find new homes. For the purposes of this Pledge, electronic stimulation devices include (but are not limited to) products often referred to as: e-collars, training collars, shock collars, e-touch, stimulation, tingle, TENS unit collar, remote trainers, and e-prods. The Shock-Free Coalition has been developed purposely to bring together parties that have mutual business interests and a personal investment in the welfare of pets. The Coalition embraces stakeholders of similar values and interests, enabling all parties to combine their resources and become more successful in achieving the stated goals. To engage and educate pet owners and shelter/rescue workers to help them make informed decisions about the management, care and training of the pets in their charge. To build a worldwide coalition that provides pet owners access to competent, professional pet industry service providers. To create widespread pet industry transparency and compliance regarding how professionals implement their services and communicate their philosophy to pet owners. “Electric shock has no place in modern dog training and behavior management. It is never necessary, and is inhumane and side effect-laden. I know of no valid argument for the continued sale of these devices.” - Jean Donaldson, founder and principal instructor, The Academy for Dog Trainers and author of The Culture Clash. “It is my honor to join the PPG in the movement to stop the use of shock collars for training and behavior and participate in the campaign to raise awareness of the devastating effects on canine health and well-being as well as the damage to the relationship between dogs and their people." - Linda Tellington-Jones Ph.D. (Hons), developer of the Tellington TTouch Equine Awareness Method (TTEAM®) and Tellington TTouchTM. “I’ve witnessed first-hand the destructive power of shock collars in dog training. Shock collar and electric fence companies will tell you they’re not harmful when used ‘correctly,’ but this is false. What they don’t tell you about is the damage these devices can do, both to the human/canine bond and to a dog’s emotional stability. The ineffectiveness of these tools in terms of emotional shutdown is common and research has also effectively shown that using shock to train dogs is ultimately harmful and should be avoided at all costs.” - Victoria Stilwell, dog behavior expert and trainer, host and presenter of Animal Planet’s It’s Me or the Dog. “It is morally reprehensible to use shock to control the behavior of the sentient, sensitive beings we call our best friends. Shock collars work because they hurt, and it is absolutely possible to train dogs successfully and effectively without using them. If you don’t have to hurt and frighten your dog in the name of training, why on earth would you?” - Pat Miller CBCC-KA CPDT-KA, director, Peaceable Paws Trainer Academies. “The behaviors for which people wish to use shock in dogs are those that annoy humans. These behaviors are either signals or nonspeciﬁc signs of underlying distress. The question should be, are we doing harm when we use shock to extinguish behaviors, some of which may be normal? If one is considering the mechanism of cellular learning, the answer must be yes.” - Karen L. Overall MA VMD Ph.D. DACVB, editor-in-chief, Journal of Veterinary Behavior: Clinical Applications and Research. “I’m shocked to learn about shock collars and I support the drive to ban them.” Dr. David Suzuki Ph.D., award-winning scientist, environmentalist and recipient of the Order of Canada. “Anxious dogs freeze or flee when startled. These are natural responses. The more anxious a dog is, the easier it is to scare the dog into immobility. Immobility is not the same as calm or happy or obedient. Immobility can mean being frozen in fear. Aversive corrections and punishment-based training methods startle dogs into immobility. Harsh verbal corrections, choke collars, prong collars and shock collars are all positive punishment strategies – positive in that they add an undesirable consequence in order to get the dog to “stop” – with the shock collar being the most evil villain of all. Good people who care about dogs still fall victim to the lie that this collar does NOT hurt dogs. It does. It hurts both physically and emotionally. If it didn’t hurt enough to scare the dog, then it wouldn’t stop the behavior. The seemingly innocent beep (also called a tone) is threatening – as threatening as pointing a gun at someone, but stopping short of pulling the trigger. The beep may not cause physical pain, but it still causes fear and is not in the best emotional interest of our dogs. Our anxious dogs deserve empathy and compassion, not shock or the threat of being shocked. 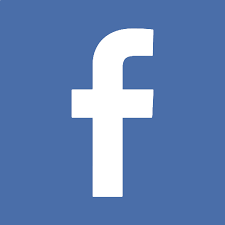 Please help by taking shock off the table.” - Theresa L. DePorter DVM MRCVS DECAWBM DACVB, veterinary behaviorist.